Sometimes two legs are not enough for stability on the trail. A hiking or walking stick is the traditional way to give yourself a little more stability. Walking with two poles can provide even more stability and other workout benefits. Fitness walking poles, Nordic walking poles, and Exerstrider poles are designed for exercise on streets, sidewalks, and paths. Trekking poles are designed for use on trails and uneven terrain. A single walking stick, pole, or staff can give you stability, especially on loose terrain or when crossing streams. It also can relieve stress on the joints. A staff can also give you a measure of security as attackers may be more likely to go annoy somebody who doesn't have a stick. You can find a variety of designs for single walking sticks, including those made of natural wood, as well as lightweight aluminum sticks that telescope or fold for ease of packing when you aren't using them. You can buy single walking sticks at an outdoor store or online. You can also be crafty and make your own walking stick. Two sticks are better than one on the trail. Using a pair of hiking poles or trekking poles gives you balance and takes more stress off the lower body joints. The grips and straps are designed so you can push down on them to assist yourself on the trail, but also for quick release if the pole gets stuck between rocks or roots. A pair of fitness walking poles allow you to burn more calories while feeling no greater exertion when walking on streets, sidewalks, and paths. These poles come with instruction manuals and often with videos for the proper technique. Nordic walking grips are designed for that technique, with a half-glove to allow the proper release of the pole on the backswing. They come with a removable rubber tip for switching between hard and soft surfaces. Get off on the right foot with your walking poles by fully reading the instructions. Poles come with illustrated booklets, videos, or links for these online. It can take practice until you are using them to the fullest advantage. There are at least three different techniques: Nordic walking, exerstriding, and hiking. 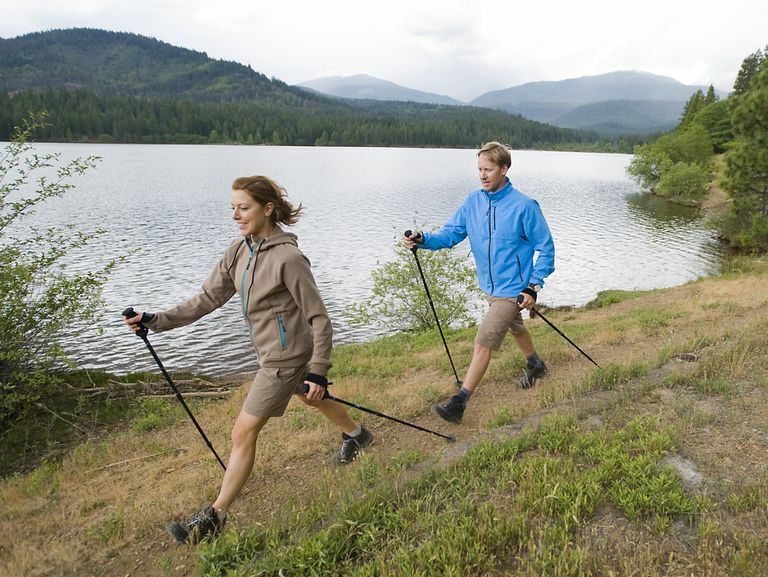 With Nordic walking and exerstriding, you are adding more vigorous motion to your walking, while with the hiking technique you are simply adding stability. The best walking pole grip is one with a positive angle, which relieves stress and overuse of the wrist joint. Grip designs differ for fitness walking and for trekking—select the pole to match your activity. Retention straps also differ, with a half-glove used for fitness walking and a simpler strap for trekking. A quick-release mechanism for the strap or glove is very useful. One-piece poles are lighter, quieter and will be the best choice for Nordic walking. For trekkers, adjusting the length as you go uphill and downhill allows you to keep the correct angle. For travelers and hikers, poles that compact to store or carry in your luggage or in your pack on the trail are very handy. You may also want a padded travel bag for air travel with one-piece poles. Be aware that walking poles may not be allowed in carry-on luggage for air travel. While airlines may say they accept them officially, in practice it's the security personnel on the ground who determine whether or not they can fly. Many trekkers on the Camino de Santiago choose to buy poles when they arrive and leave them behind so they don't have to check luggage to and from Europe. Poles made for fitness walking often have a rubber "paw" made for walking on asphalt, set at the proper angle to hit the pavement. Others use a rubber tip similar to a cane tip, which wears unevenly. These are removable and there is a carbide tip underneath for gripping natural trails. For walking in sand, snow, or soft trails, trekking baskets keep your poles from sinking into the soft surface. Many also come with snow baskets, which allow you to use them for snowshoeing. Cork inside the poles can act to reduce shock. Some poles use springs to act as shock absorbers. These systems generally add more ounces to the poles but can increase your comfort in using the poles. Bullo V, Gobbo S, Vendramin B, et al. Nordic Walking Can Be Incorporated in the Exercise Prescription to Increase Aerobic Capacity, Strength and Quality of Life for Elderly: A Systematic Review and Meta-Analysis. Rejuvenation Research. 2017. doi:10.1089/rej.2017.1921. Grainer A, Zerbini L, Reggiani C, et al. Physiological and Perceptual Responses to Nordic Walking in a Natural Mountain Environment. International Journal of Environmental Research and Public Health. 2017;14(10):1235. doi:10.3390/ijerph14101235. Pellegrini B, Boccia G, Zoppirolli C, et al. Muscular and Metabolic Responses to Different Nordic Walking Techniques, When Style Matters. Di Giminiani R, ed. PLoS ONE. 2018;13(4):e0195438. doi:10.1371/journal.pone.0195438. Tschentscher M, et al. Health Benefits of Nordic Walking. American Journal of Preventive Medicine. January 2013. Volume 44 , Issue 1 , 76 - 84.